The global nanoemulsion market is witnessing high competition due to presence of several players, observes Transparency Market Research (TMR). Some of the prominent players operating in the global market for nanoemulsion are Mitsubishi Tanabe Pharma Corporation, GlaxoSmithKline plc, Sanofi, Novartis AG, AbbVie Inc., Allergan plc, AstraZeneca Inc., Kaken Pharmaceutical Co., Ltd., Fresenius Kabi AG, and B. Braun Melsungen AG. These companies are increasingly investing on research and development activities for launch of advanced nanoemulsion products. 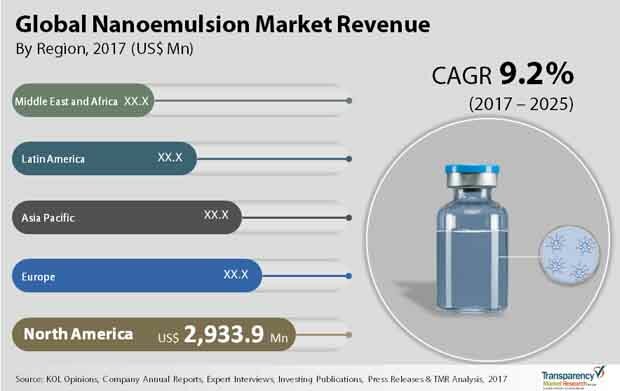 The revenue of the global nanoemulsion market was registered in 2016 at the value of US$6.78 bn and expected to grow with the CAGR of 9.2% over the forecast period and attain the value of US$14.91 bn by the end of 2025. The NSAIDs is expected to attain revenue of US$2.470 bn due to the increasing usage nanoemulsion formulation in topical and other form of drugs and its route of administration for efficiency. On the basis of region, North America accounted for the larger share of about 39.7% in 2016. This growth of the region is attributable to increasing demand from mature pharmaceutical and biotechnology market and increasing research activities in the region. Nanoemulsion are able to dissolve large amount of hydrophobics coupled with ability of protecting drugs from processes such as hydrolysis and enzymatic degradation make them ideal carrier. The several advantages of nanoemulsion over conventional emulsion including micro-droplet size of nanoemulsion with higher efficiency as a better carrier. The aforementioned factors are driving growth of the global nanoemulsion market. The factors such as rapid technological advances in the field of pharmaceuticals and biotechnology industry, increasing awareness about chronic diseases and availability of treatments are positively influencing growth of the global nanoemulsion market. Additionally, numerous government policies favoring the target specific drugs delivery systems are boosting adoption of target specific drug delivery systems which is fuelling growth of the global nanoemulsion market. Launch of technologically advanced products to meet the demand for efficient drug delivery systems is positively impacting on a growth of the global nanoemulsion market. Increasing healthcare facilities mainly in the developing countries, increasing economic stability, and increasing contribution of key players in in developing economies such as Latin America, Asia Pacific, and the Middle East and Africa. This is propelling growth of the global nanoemulsion market. However, manufacturing cost of nanoemulsion are restraining growth of the global nanoemulsion market. Nevertheless, other advancements such as the no effects of flocculation and sedimentation, and non-toxic nature makes them suitable to be used in beauty products and baby-care products such as creams and lotions. The adoption from personal care industry has created lucrative opportunities for key players in the global nanoemulsion market for growth and high revenue generation. Transparency Market Research is a next-generation market intelligence provider, offering fact-based solutions to business leaders, consultants, and strategy professionals. Our reports are single-point solutions for businesses to grow, evolve, and mature. Our real-time data collection methods along with ability to track more than one million high growth niche products are aligned with your aims. The detailed and proprietary statistical models used by our analysts offer insights for making right decision in the shortest span of time. For organizations that require specific but comprehensive information we offer customized solutions through ad hoc reports. These requests are delivered with the perfect combination of right sense of fact-oriented problem solving methodologies and leveraging existing data repositories. TMR believes that unison of solutions for clients-specific problems with right methodology of research is the key to help enterprises reach right decision.